JOHN E. GRANT & MARY LYNN JOHNSON *↤ The writings of John E. Grant (University of Iowa) on Blake have been widely published. He is now collaborating with E. J. Rose, M. J. Tolley, and D. V. Erdman on the Clarendon Press edition of Blake’s Designs for Young’s Night Thoughts. Mary Lynn Johnson (Georgia State University) has published on Wordsworth in SiR, Blake in JEGP. Her essay on Blake and emblem literature recently appeared in Huntington Library Quarterly, her note on Milton in Blake Studies. Johnson and Grant are working on a comprehensive study of the copies of The Book of Thel. Until the forthcoming Bentley Census appears, it is helpful to get information about the present location of illuminated books listed as untraced or as privately owned in the Keynes-Wolf Census. Whether any particular location is desirable could be debated. If the most important consideration were accessibility of at least one Blake original to the largest number of people in the widest possible area, all should rejoice to hear that an illuminated book has found a home outside one of the well-known Blake repositories. But given the practical necessity of arranging to study several works during a single research trip, as well as the importance of comparing more than one copy of the same work, the scholar may find himself hoping that a sale or a bequest will send a book to one of the great public collections where Blake’s works are already concentrated. Happily, democratic and scholarly interests are not always at odds: an account of the holdings of the Cincinnati Art Museum contains good news for everyone. Somewhat remote from other Blake collections but worth an excursion from anywhere, Cincinnati has an exquisite Thel, a long-untraced Songs of Innocence, and a closely contemporary Songs of Innocence and of Experience. 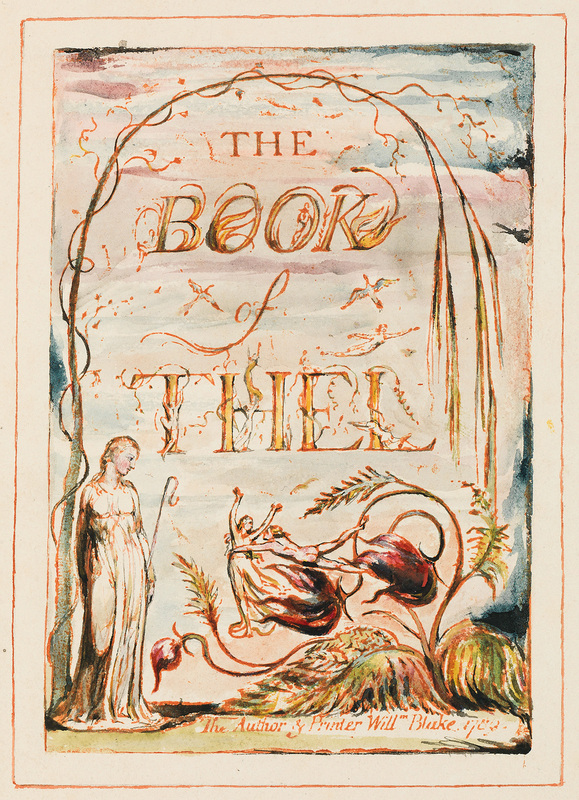 Nancy Bogen, ed., William Blake, The Book of Thel: A Facsimile and a Critical Text (Providence and New York, 1971), notes that Thel copy N is now in the Cincinnati collection (accession number 1969.510—as the gift of John J. Emery). Since Bogen’s color descriptions are sometimes unreliable, one should consult the Keynes-Wolf Census for an idea of the brilliance of this copy. 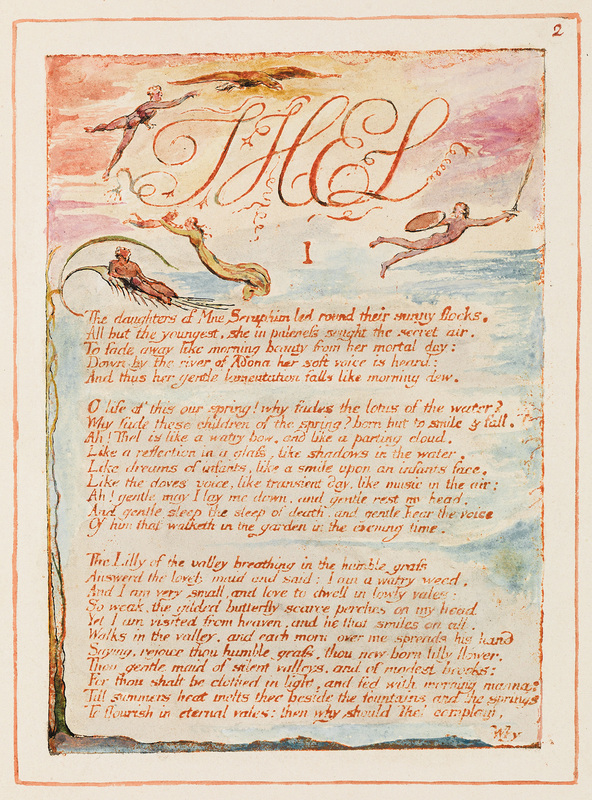 Only the Rosenwald copy O, on which the Blake Trust Facsimile is based, is a Thel of comparable magnificence, though in quieter and calmer tones. 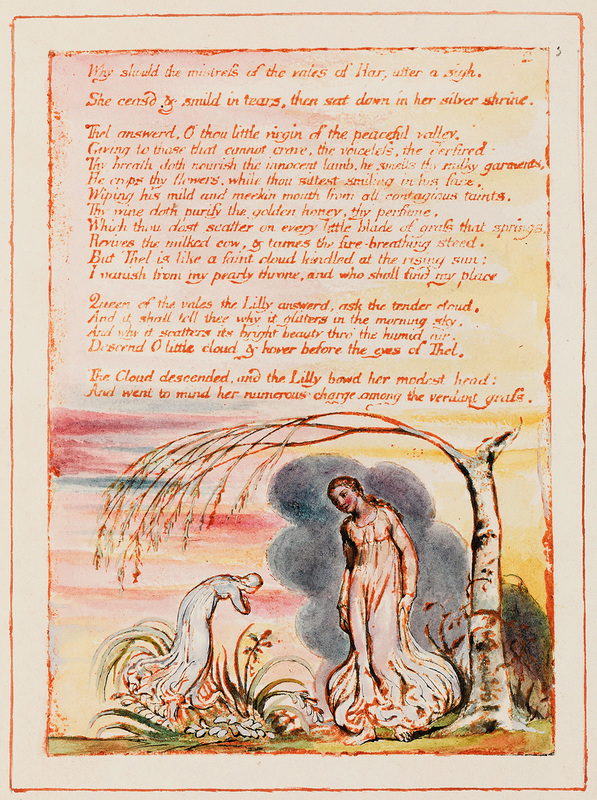 If a facsimile of copy N were made by the Trianon Press—or even if it were as well reproduced as the Dent volumes—we would have a clearer idea of the power and range of Blake’s coloring. These intimately related copies differ strikingly: both sumptuously painted in Blake’s later style, both done on Ruse & Turners paper watermarked 1815, copy N is impressive for its splendor, copy O for its refinement. Added details also vary: copy N has more birds, water, and peculiar cloud effects; copy O more trees and roots [see illus.]. But on-the-spot comparison of originals is obviously a far better method of study than comparison of notes and facsimiles, and the Cincinnati Art Museum also affords an opportunity for this kind of work. Its Songs of Innocence and the Innocence section of its Songs of Innocence and of Experience are both on paper watermarked J WHATMAN/1808, both arranged in the same order, both decorated with gold. The Innocence may be identified as copy S of Songs of Innocence, formerly in the George C. Smith, Jr. collection, but listed as untraced in the Census. The following addenda and corrections to the Census account may be presented:1↤ 1 Extensive corrections or additions to the Census are marked with an asterisk at the beginning and a G-J at the end; information in the Census that we assume to be correct but cannot independently verify is marked with an asterisk followed by a C. We have not attempted to bring our style and spelling into absolute conformity with the Census. The pictures: Reproduced with the article are plates ii (the title-page), 1, and 2 of The Book of Thel copy N, Cincinnati Art Museum, gift of John J. Emery. By permission. Exhib: Philadelphia, 1939, no. 42. Among the noteworthy features of this copy is the fact that water has been indicated at the bottom of “The Lamb” and in the bottom foreground only (not the sides) of “Spring,” pl. 2, as well as on “The Little Black Boy,” pl. 2, where it always occurs because it was actually cut on the plate. But no water has been added to “Introduction” to Innocence, “The Ecchoing Green,” pl. 2, “The Chimney Sweeper,” or “Night,” pls. 1 and 2, pages where it often occurs in later copies. The Little Black Boy is made darker than the white boy, and the Good Shepherd smiles at the white boy. There is a small gray stump with a broken branch at the left beside the water on this second plate of “The Little Black Boy,” in an area Blake frequently varied either by depicting assorted vegetation or by eliminating it entirely. The statement in the Census that no authentic separate copy of Songs of Experience is known to exist has sometimes been taken as proof that Blake never issued Experience separately. This assumption has been used as the basis for theories concerning Blake’s over-all meaning. Yet the evidence of copy S, as well as of F, O, Q, and R—some of which have differences in paper and pagination as well as in printing between Innocence and Experience—suggests that these composite copies may not originally have been issued as whole copies by Blake. Perhaps the fact that Innocence was bound after Experience in the Cincinnati copy indicates an owner’s effort to put together what Blake had issued separately. It is true, however, that despite the differences in printing of the two cycles of poems in copy S, there is a considerable similarity in the general quality of the painting throughout, although to less attractive effect in Experience. On the other hand, the character of the coloring in the Innocence section of this copy is almost as close to that in the separate Songs of Innocence copy S as it is to that in its own companion Experience section. Perhaps in that happy far-off day when filmstrips of all the illuminated books will become available we shall be better able to explain the affinities and variations among copies.